What I do want to talk about is the amazingly versatile and powerful Dungeon Master tools, and what SCL could mean for old-school pen and paper gamers around the world, specifically because you can create adventures, or even whole campaigns, with those tools. I haven’t gotten a chance to get my hands on the game yet, but from what I’ve seen, you can create amazingly detailed quests and dungeons, as well as fun and varied NPCs and encounters. So, if you’re interested in a somewhat lengthy breakdown of the dungeon master tools, and my opinions on them (with pictures! ), keep reading. Each section has a header, so feel free to skip past the areas that may not interest you. Now, let’s take a look at some of the features in Dungeon Master mode. Many games allow you to create dungeons, and while SCL of course has that feature as well, it also gives you the ability to create outdoor and interior zones. 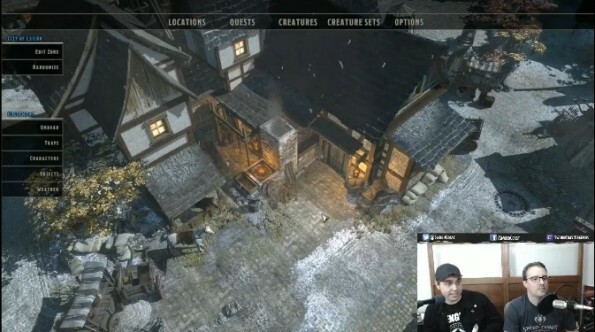 The option to add NPCs inside houses, near market stalls on a city map, as well as create bandit camps outdoors, or spooky forest paths adds so much more depth to a campaign than we’ve seen in games like these before. 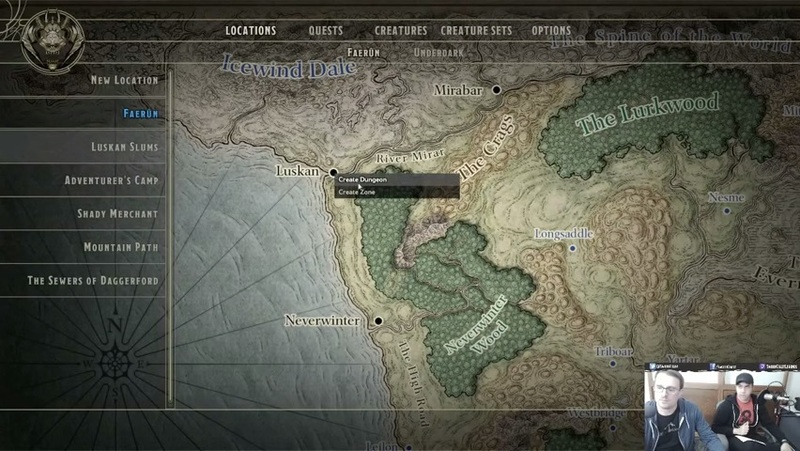 I think that being able to add many different locations to a campaign will help players get more of a “pen and paper RPG” feel than other games have been able to provide. Set the size of the dungeon. The number of floors to the dungeon (the max number is currently ten) and the number of tiles that are populated will vastly impact the time it takes to complete the area. Choose the complexity of the dungeon. This controls the number of branching pathways within the area. Decide which tile set you want to use. This controls the shape of the rooms, and the look of the dungeon. For example, if the “sewer” tile set is chosen, you’ll get rooms that look like they have sewer water running under walkways, pipes, grimy stone walls, and all the features that you think of when you think of a typical sewer. 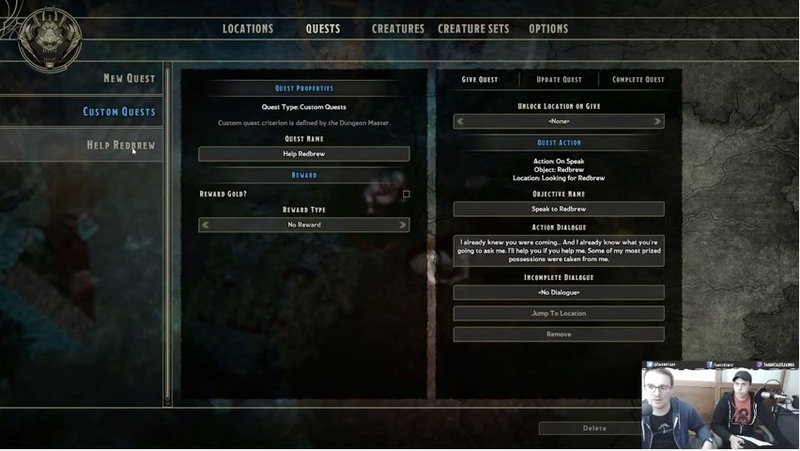 Choose two types of creature sets with which the tool will use to populate the dungeon. You can manually place creatures of different types within the rooms, but the tool will pull from the two specific sets you chose to generate random encounters. 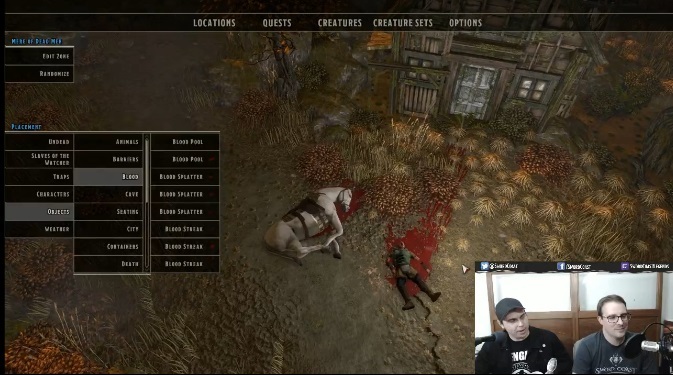 These creature sets can even be custom ones you’ve created ahead of time! While encounters are randomly generated, they can always be modified (sometimes from the ground up!) to suit your needs, or cleared completely. Encounters can be sets of monsters, single monsters, patrols, boss encounters, traps, ambushes… the possibilities are plentiful! Mull over how evil you want to be to your players, and then decide the difficulty level for the dungeon. 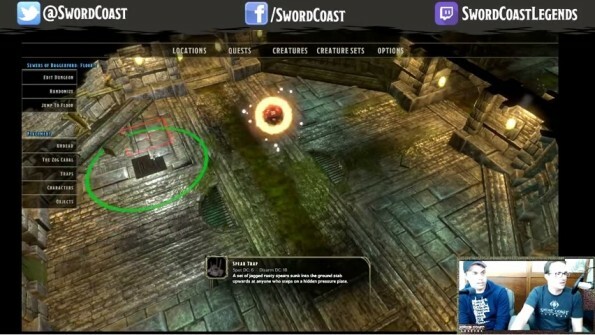 You can also further customize each dungeon and area with unique names and flavor text that your players will see upon zoning in. This can help give your campaign and adventures a more personal feel, and give the players a bit of useful information (or even hints!). If a dungeon isn’t quite the right shape, a DM can always re-roll it to generate a different pattern of tiles until they find something they like. At the beginning of this section, I mentioned how the SCL tools cater to almost any DM style. Unfortunately at this time dungeons cannot be created “tile by tile”. What this means is, you cannot place rooms down manually to form a dungeon of your own design. A lot of prospective dungeon masters are crying out against this, and I do agree that it would be nice to have complete control over the room placement. However, I only really design an adventure with a specific map in mind sometimes. Many times, I will use random dungeon generator tools I find scattered around the internet to come up with maps for my campaign. In fact, sometimes I come up with new ideas or twists because of randomized maps. What I’ve seen so far from the tools allows a DM a multitude of ways to customize the randomized maps. Someone could take a generated map, and go room to room, painstakingly filling it out with traps, treasure, objects, NPCs and monsters, carefully cultivating the exact feel and story that they want to tell. The tools also allow a DM to roll up a quick map, populate it in minutes with fun challenges and bits of story, and dive right in to play with their friends. 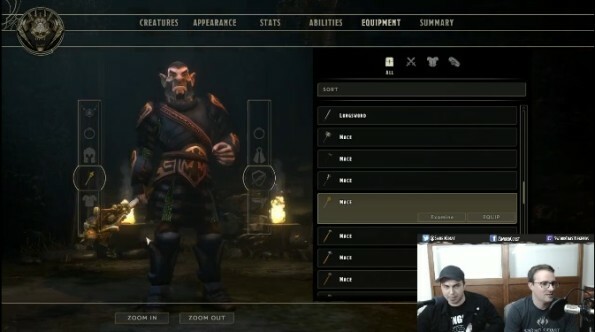 Another really cool feature of the upcoming game is the ability to take the iconic monsters from Dungeons and Dragons and customize them with armor dyes, different weapons, and unique names. You can also scale the monster down levels, you can boost the monster up a few levels to give the players more of a challenge, or you can add all new abilities to throw your players off and make them think on their feet. Monsters can be “promoted” or “demoted” in real time to help DMs better control the challenge of their adventures. You can also knock health off quickly if your party is in trouble, remove them altogether, or spawn more on the fly. But by far the most innovative feature has to be the ability that allows the DM to “jump into” a monster and take control of its abilities to wreak havoc on a party! I’m already envisioning epic RP monologues, taunts and jeers as the players and the DM battle it out in the middle of a dungeon, in real time. Thankfully, DMs aren’t limited to using stock maps with static items. Dungeons can be filled with piles of bones, blood spatters, furniture (broken or whole), corpses, chests, crates, barrels, altars, torches… the list goes on and on! Even in interior areas, items can be removed and new ones can be added. Some objects are even breakable, giving DMs a whole new mechanic to tease, taunt, stymie, and challenge a player’s creative thinking! Objects in SCL DM mode aren’t just available to spruce up player spaces, however. They can also be important to quest completion, and overarching campaign stories! 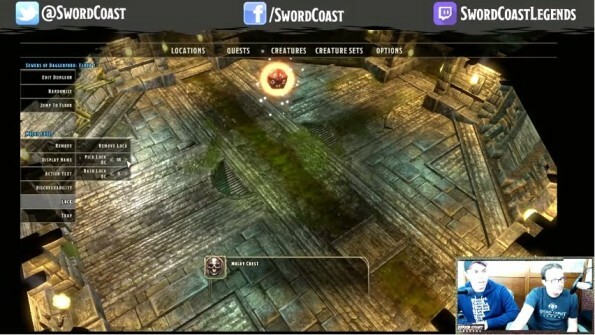 The ability to add flavor text to objects gives DMs new ways to impart information, hints, and tips to watchful players. And the ability to attach quests to objects found in the world opens up the possibilities for adventure even more. Even with all of these other features, what would a dungeon be, if it didn’t have traps? SCL delivers on this front, too, with a variety of different traps to pick from. Some randomly generated encounters will be rooms full of traps, but of course a DM can place them down manually to create hazards in front of doors, treasure chests, or wherever seems best (or worst, from the player’s perspective!). They can also be used to slow a party down, and make them look a little more closely at their surroundings. These aren’t the only challenges a party will face in a dungeon in SCL, though. 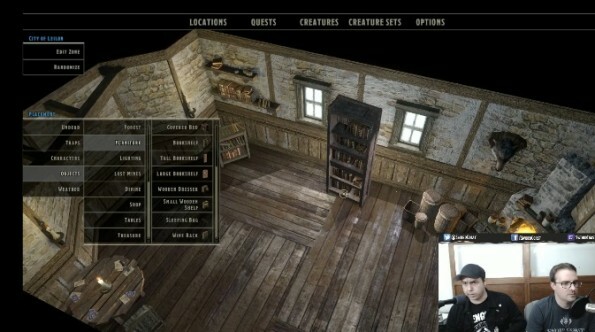 The DM can also control access to treasure, story plot, and special rooms by locking an object, or making it “discoverable”. Full control over the difficulty lies with the dungeon master, as they can set the difficulty checks to be very high, to challenge the players, or very low, to make things a bit easier. Chests even have a “break open” check that can be set, so that anyone with the strength to do so can access the loot. If a “regular” object (not a door or chest) is made “discoverable”, extra flavor text can be added. This can help guide a party towards their goal, give them hints about possible dangerous to come, or be complete fluff! This can also be a useful way to hide a quest objective, to make the party really work for it! If you’ve ever wanted to populate a 3D game environment with interesting characters and personalities, SCL can help. NPCs can be created quickly on the fly, or can be hand-crafted with gear, weapons, dyes, and special abilities.We haven’t been given the full details of character creation yet, but what we have seen is very promising. 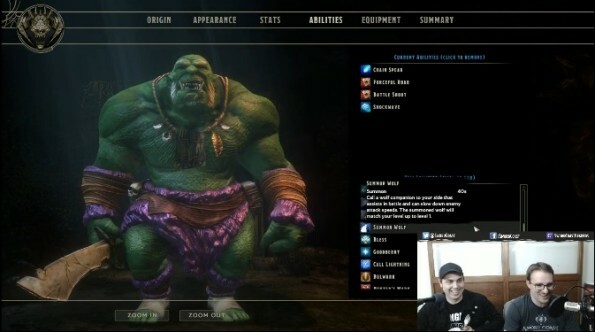 NPCs can be created as vendors to sell players items, they can offer tips and hints to the players via dialog, they can offer quests and reward players for completing them, and they can be assigned as allies or enemies. Setting an NPC to “hostile” means that it will attack the party on sight. Neutral NPCs remain, well, neutral. And if an NPC is set to “friendly”, they will follow the players throughout the zone and offer help against challenges, using whatever abilities they have to aid the party. If created as an ally, the NPC will have to be placed in each new zone the DM wishes them to appear in, as an NPC won’t follow a player across zone lines. We’ve already touched a bit on this topic in almost all the previous topics, but let’s delve into this weighty subject properly now. The quest options in SCL are, simply put, astounding. Are they as detailed as a quest you could make in a pen and paper RPG? No, of course not. But they are damn good for a computer game. There are a few different ways to craft the quests you’d like to use in SCL. Templates of popular types of quests are available for you to use. For example, there is a “kill quest” which is your typical “I need these monsters taken care of. I’ll reward you if you kill them” type of adventure. There is also a “defeat boss” template, which is exactly what it sounds like. and a “collection” quest template which would ask players to locate objects in the game. Using the templates is the quickest way to create adventures for your players. 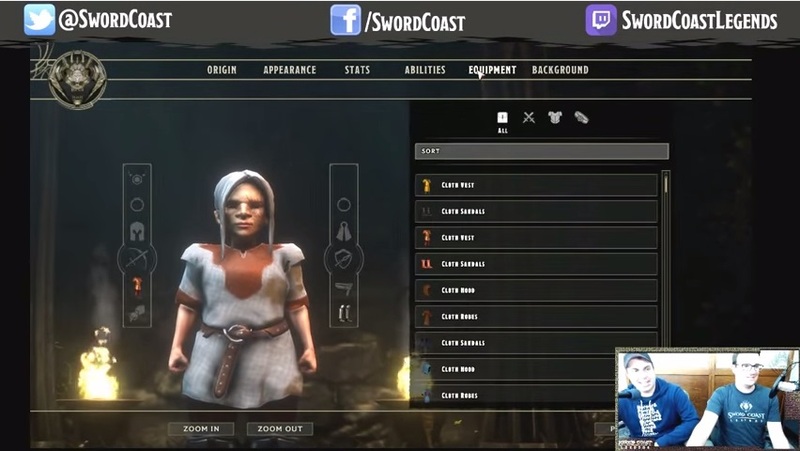 However, by far the most powerful of the quest creation tools is the “custom quest” option. You can create a quest, assign it to a person or object with dialog and/or flavor text. You can create steps towards updating the quest, rather than just completing it with a single step. 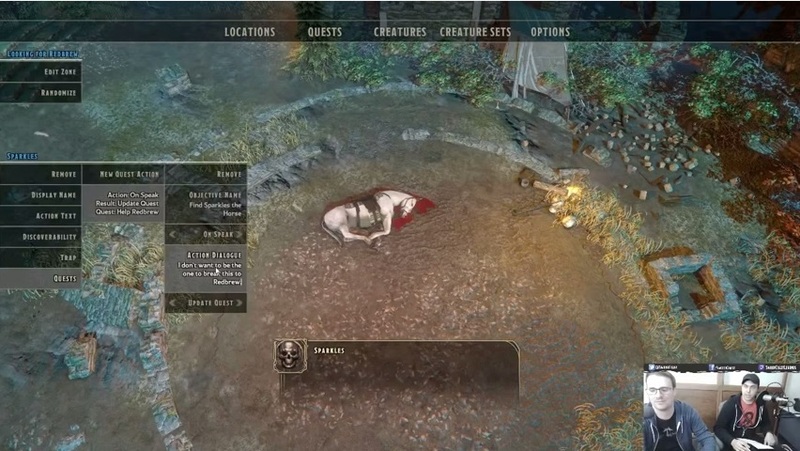 You can also create sub-quests and branching quests in this way. 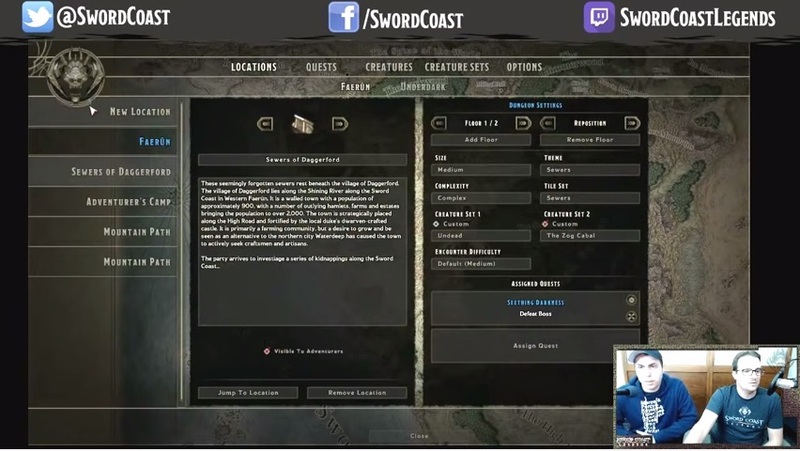 The versatility of the quest creation tools make a DM like me start thinking about all the different ways to use them to create stories immediately! As you can see from just that quick example, you can layer quests to create a linking, overarching plot with many branching quests, sub-quests, hidden secrets, and lots of fun! The last feature of the Dungeon Master mode in SCL I want to touch on is the way they’ve added ways to help the DM judge encounters and balance challenges. As the party goes through the dungeon and defeats monsters and traps, a special bar called a “threat meter” goes up for the DM. Points are added to the meter as the players successfully move through the encounters. These points can be spent by the DM to summon new monsters, place new traps, and directly control the dungeon denizens to give even more challenges to the players! Conversely, if the party isn’t doing as well, the threat meter for the dungeon master decreases. 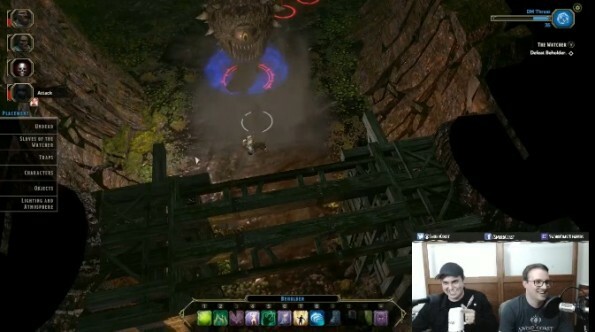 This gives the DM a visual signal that maybe a few monsters need to be removed, or demoted to a lower level, or some traps need to be taken out. It’s a quick, easy way to signal the DM that the players are struggling, and need something just a bit easier. I absolutely LOVE this feature. As a DM, sometimes it’s hard to judge whether you’re challenging your players the right amount, A lot of times it’s easy to see when an encounter is too hard, and it’s very plain to see when it’s too easy, and the players breeze through your dungeon like a summer stroll! But the threat meter helps you gauge when you’re challenging them just enough, and gives you immediate feedback for when you should throw something extra their way, or ease off. 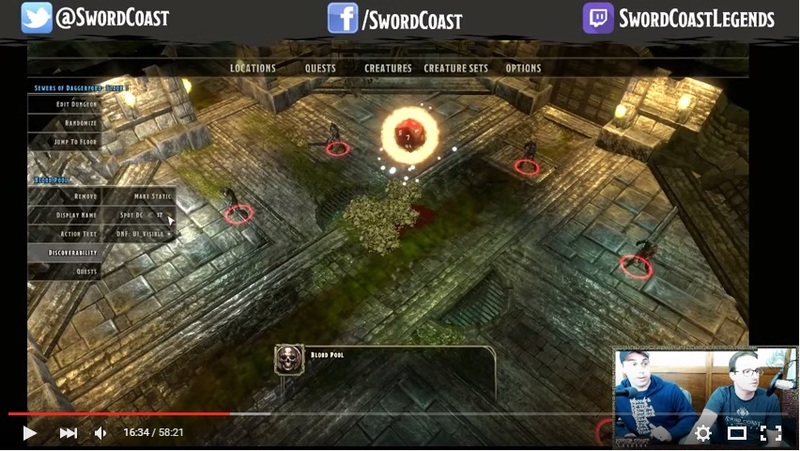 So now you know some of the neat features that will be included in the Dungeon Master mode available as part of Sword Coast Legends. And you may have been able to pick up on how excited I am by them… But WHY am I so excited you ask? Well, for a very good reason! Sword Coast Legends actually offers a viable alternative to pen and paper gaming with friends far away. 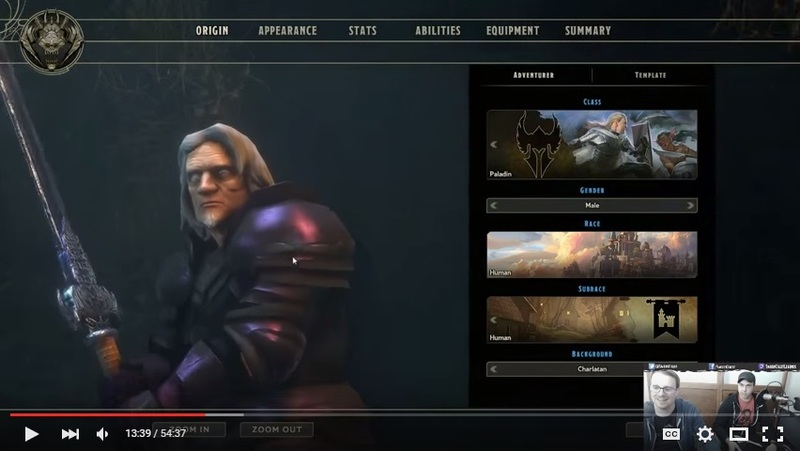 MMOs just didn’t cut it because they weren’t our own stories. Sandbox games are time consuming and often don’t have the features we’d like. But SCL delivers. Gather your friends and jump back into Faerun; create NPCs and monsters, quests and dungeons, even a whole campaign! But most of all; create new gaming memories with the people who helped you love adventuring. Want to get in on the action? Pre-order now! This entry was posted on August 19, 2015, in Gaming and tagged D&D, DM, Dungeon Master, Dungeons and Dragons, Faerun, gaming, review, RPG, SCL, Sword Coast Legends. Bookmark the permalink.